August 12, 2011 (Sacramento) -- The U.S. Department of Agriculture has designated of August 7-13 as National Farmers Market Week. California now has 758 certified farmers’ markets—more than any other state in the nation. Find local farmers’ markets, roadside produce stands and other fresh food venues at East County Magazine’s Guide to Fresh Local Foods: http://www.eastcountymagazine.org/0809freshguide. 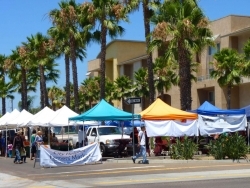 Certified farmers markets provide sales venues for certified agricultural producers selling healthy and high-quality produce directly to consumers. Until 1977, regulations required farmers to properly pack, size and label their fresh fruits, nuts, and vegetables in standard containers to transport and sell anywhere other than the farm-site. Recognizing the importance of farmers to consumer sales, the department revised regulations allowing for the creation of California certified farmers markets. These markets are now part of the fabric of many communities throughout the state. Furthermore, farmers markets are an important source of fresh produce to many seniors and low-income families who can purchase fruits and vegetables through the Senior Farmers Market Nutrition Program; the Women, Infants and Children’s (WIC) Supplemental Nutrition Program; and the CalFresh program. Both the number and size of farmers markets in California and the United States have grown dramatically in recent years, prompting state and national advocates of local farming to designate a week each year to take note of their benefits. California joins the nation in celebrating National Farmers Market Week.